This Summer Berry Dessert Crostini recipe is a light and delicious summer dessert. You can also call it dessert bruschetta. It uses ripe summer berries, mascarpone cheese sweetened with honey and grilled baguette. This easy dessert is super quick to make and a real crowd pleaser! I dreamed up this recipe one Friday morning while I was sitting at my desk at work waiting to get out early. Obviously I was hungry (aren’t I always??). It was the first week or two that the homegrown Strawberries were showing up in our stores and at the public market and I was thinking about how I wanted to enjoy them. I thought a twist on Bruschetta or a Crostini might be fun so I dove right in and just went for it. Let me first say that I could pretty much eat that mascarpone cheese with a spoon. The honey adds a subtle sweetness without being overbearing and that creaminess creates a decadence that takes this dessert over the top. I went with a multigrain baguette to add a deliciously nutty flavor and texture. I used a pastry brush to brush the slices with olive oil and lightly grilled them. They ended up with a crisp exterior while still maintaining the chewy center that we all love from baguette. Initially, I tested the berries on the stove but they broke down too much and became more of a chunky sauce. It was a delicious sauce, but it wasn’t want I envisioned for this recipe. So my next move was to sprinkle some sugar onto the raw berries and let the mascarate for an hour or two. The berries broke down just enough to make them a bit juicier while still maintaining the right texture. This is the perfect light dessert to follow a relaxing dinner outside on a warm night. Pair this with a crisp Riesling and you have yourself one hell of a dessert that will surely impress even the pickiest of guests (and my two year old also loved it!)! 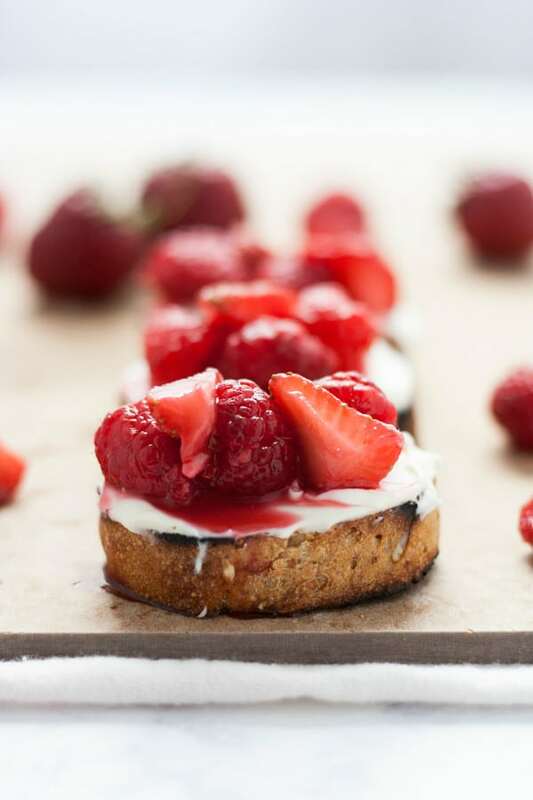 This Summer Berry Dessert Crostini recipe is a light and delicious summer dessert. You can also call it dessery bruschetta. 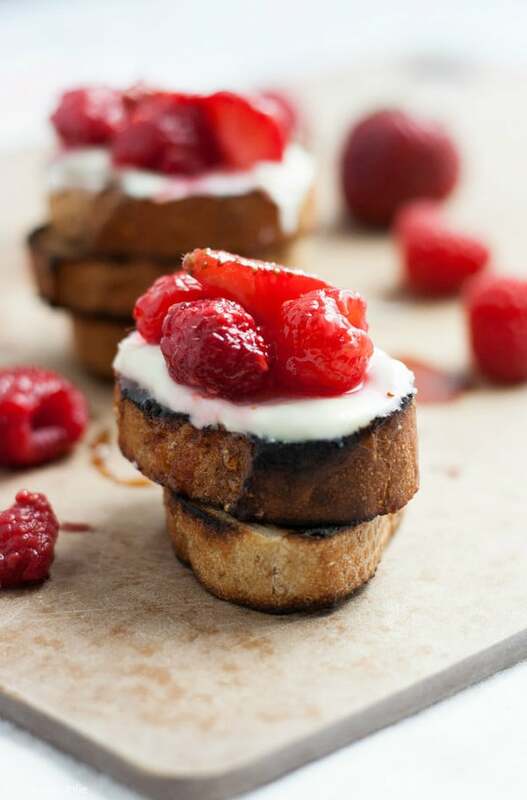 It uses ripe summer berries, mascarpone cheese sweetened with honey and grilled baguette. This easy dessert is super quick to make and a real crowd pleaser! Sprinkle your berries with sugar and allow to mascarate for at least an hour. While your grill is heating, mix your honey with the Mascarpone cheese until smooth and well combined. Set aside. Brush your baguette slices with olive oil and grill until they get some nice brown grill marks, about a few minutes of each side. Spread some of the cheese mixture onto each slice of baguette and then top with berries. Enjoy! BBQ Pulled Pork Tacos Tessa is a 4 month old! July 10, 2016 at 3:48 pm Welcome to Yum Goggle! We are now following you on all your social media platforms and hope you will follow us back. We will do our best to tag you each time we promote your posts. Kelli at YG! July 13, 2016 at 1:57 pm This would be such a fun dessert for a party! 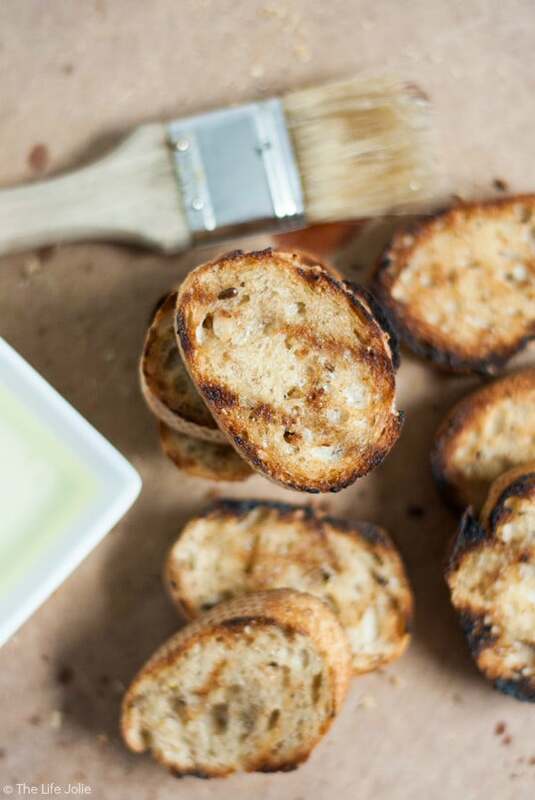 I love crostini and these definitely wouldn't disappoint. Thanks for sharing with us at Merry Monday this week!